Add $5 for mailing charges. Trusting the Muses is a wonderfully well-organized book of lessons. The insights and illustrations by Virginia Huber go hand in hand to lead the independent art student into self-discovery and bold exploration instead of blind imitation of another artist's vision or style. A very valuable tool. There is so much more in it than any other book I've read on watercolor. 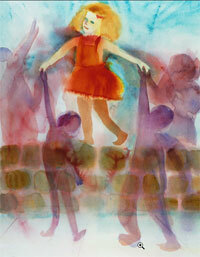 In fact, it is a fully comprehensive lesson in ART, not just watercolor. If you approach watercolor painting seriously and have great artistic ambitions you will find useful advice in this book gleaned from years of painting experience. And if you're only a raw beginner you'll find the basics of watercolor painting explained for you in this book. It isn't often the case that a how-to book written by an accomplished artist and instructor helps you (even encourages you) to paint in whatever style you want to paint in. It has captured a watercolor class experience as well as any book can. painting – to develop this highly readable book. It looks like a winner. Creative Writing instructor and author of In A Pickle and several other fiction and nonfiction books. This book is all about how to go about making art with a paintbrush in your hands. You may never have held a paintbrush or never held a watercolor paintbrush. You may live far from where classes are offered. Or the classes are offered at the wrong time of day for you. You may have taken watercolor classes way back that were bad experiences. No matter. If this is the right time for you to take up a brush, Trusting the Muses, will guide you on your way. 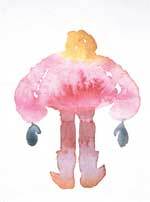 The very generic basic watercolor skills included in this book come from 30 years of teaching and working with adults. They are useful for any style of painting that you like to do. I know that because within all of my classes are people who paint with a lot of physical detail and there are those who paint highly abstractly. All use the same basic skills as they go. If you are already comfortable with the basic skills, read on, because there are more advanced techniques to play with also. This handbook can be a reference book of practical methods for you, if you are a professional artist and instructor. In a certain sense, all of us see ourselves as "independent learners" - even though we've long since stopped thinking of ourselves as students. Let's hope we're still learning!! Art teachers have already opted to use this newly released book, Trusting the Muses, as a supplemental text for their students. If you have questions or comments that appear along the way, please visit My Blog. I, or someone else, will likely have an insight. 1. Gather your art supplies, and then... Make a place for yourself to paint. 2. Drawing is a perfect painting warm-up! Painting on Soaking Wet Paper, The One-Sitting Painting, What do you do with a Soaking Wet Painting?, When is a Painting Finished? Epilogue - "Trusting the Muses"
"10 Top Reasons Why I paint Abstractly, even though I know how to paint realistically." "More Ideas for Subject Matter, Projects, or Starting Points for Studio Time"
2. Kid Art - approach to composing - Gather ahead of time: A half dozen images (photos or art) of landscapes, paper, pencil, eraser. 3. Sculptural approach to composing - Gather ahead of time: pencil, grocery bag that can be torn in pieces, eraser. 4. Additive approach to composing - Gather ahead of time: A half dozen images of people in landscape settings, pencil, paper, eraser. 5. Living Things - Gather ahead of time: Some living plant that you've recently brought inside (leaf, branch, flower) pencil, paper, eraser. 6. How do you draw a tree-part one - Gather ahead of time: Pencil, paper, eraser. 7. How do you draw a tree-part two - Gather ahead of time: A branch of a particular tree, leaf/leaves (needles/flowers/fruit) of the same tree. Bring this inside if you can. Also, pencil, paper, eraser. 8. Drawing on-site, outside - Gather ahead of time: Provisions to go outside if you can and look at this particular tree. That is, something to sit on, sun glasses, hat, jacket, insect repellent, sun block, water to stay hydrated. If that's not possible, set yourself up by a window. (If that's not possible, find a half dozen photos of trees. Search the internet for close up photos of its branches, leaves, fruit.) Also, a pencil, paper, board or tablet to hold paper, eraser. 9. Drawing from art - Gather ahead of time an example of a piece of art that you admire. Pencil, paper, eraser. 10. Setting up a still life - Gather ahead of time: Three ceramic objects that have similar shapes, or three stuffed animals, three books, or three bananas perhaps. Also, pencil, paper, eraser. 11. Drawing on the imagination - Gather ahead of time pencil, paper, eraser. Also, paints and watercolors. 12. Drawing on the memory - Gather ahead of time pencil, paper, eraser.